A user can use this tool to convert NSF file to adobe PDF format. 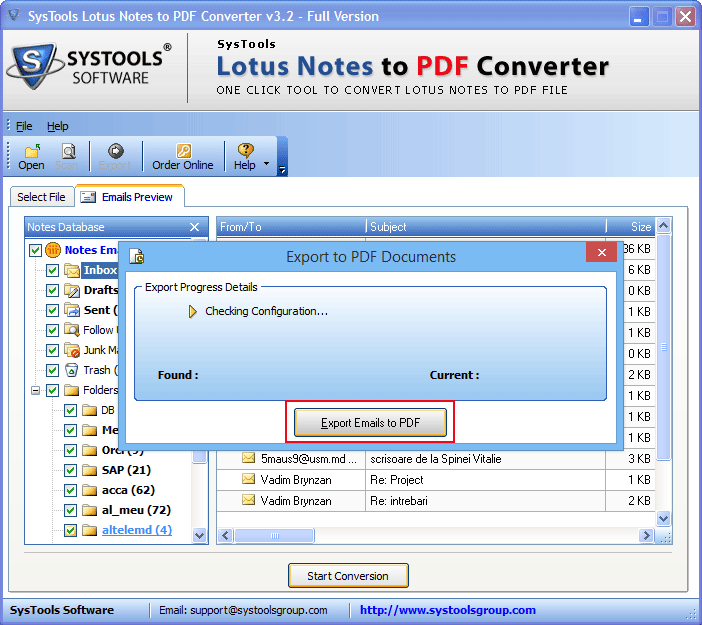 This application permits users to export all emails from Lotus Notes Inbox, Junk Mails, Sent Items, etc., to PDF format without any hassle. Moreover, it will generate single PDF file for all emails along with their respective attachments. In addition, it does not impose any NSF file size limitation. As a user add an NSF file, the NSF to PDF Converter start performing a quick scan on the file and recover all emails. However, this scanning process will detect and display all emails maintained in folder of Lotus Notes like inbox, drafts etc., in the software panel. Moreover, the tool requires Adobe Acrobat and Lotus Notes installation on the machine. When a user migrates Lotus Notes NSF files to PDF format, the tool preserve all metadata details like to, cc, bcc, dates, etc. Apart from this, it is designed in such a manner that it does not compromise the original formatting and integrity of emails. All attachments associated with emails will remain integrated into the PDF file after migration. As the scanning process of NSF file completes, the tool recovers all emails from NSF file. 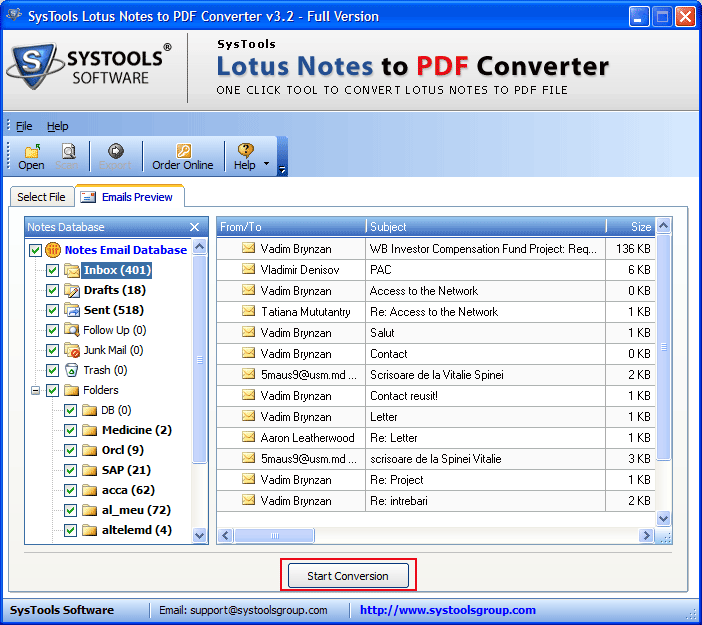 After that, Lotus Notes NSF email to PDF converter loads and generates an instant preview of the NSF emails along with associated attributes. A user can open and view the email with its properties such as to, from, size in KB, email address, subject. While converting NSF emails to PDF format, the tool provides user an option to export selective item folder or emails from NSF file. To do the same, a user just needs to check or uncheck the emails or folder, the tool migrate only that emails from Lotus Notes to PDF. Also, the software keeps the folder hierarchy intact as original while saving it to PDF. As the process of NSF file to PDF conversion starts, the tool display the real-time migration status. A user can view all details of the export process such as item folder name, subject line of the email, total number of items in a particular folder, and number of emails that are migrated. And, after conversion, the software will generate a single search-able PDF. When the Lotus Notes to PDF Migration completed successfully, click on OK button and exit the application. Does the software allow bulk migration of NSF file to PDF file? No, a user is not allowed to export multiple NSF files to PDF format in bulk with the help of this application. 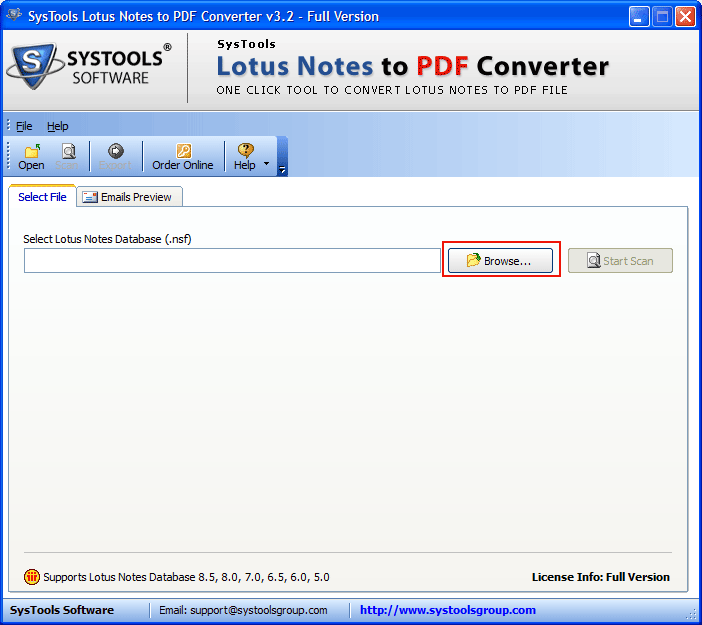 Can I use this Lotus Notes to Adobe PDF Converter on Microsoft Windows 10 OS? Yes, you can easily use this tool on any version of MS Windows OS, including Windows 10. Is it mandatory to install Lotus Notes application on the local machine? 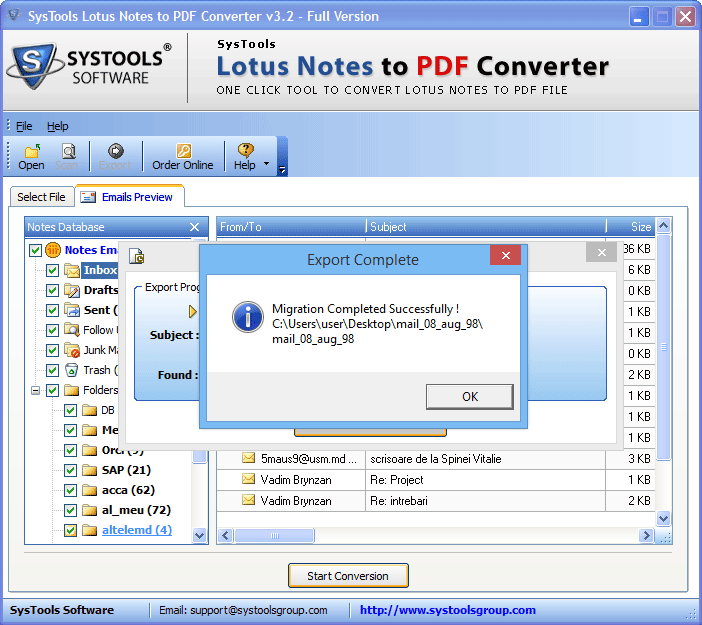 Yes, a user must have Lotus Notes application installed on the system to perform NSF file to PDF file conversion successfully. Can I export NSF emails to PDF along with associated attachments using this tool? Yes, you can migrate all emails from Lotus Notes to PDF format with associated attachments without any limitation. Does the software impose any NSF file size limitation during the conversion process? No, the NSF to PDF Conversion tool does not impose any file size limitation while converting emails to PDF format. What Client Thinks About Notes to PDF Converter? I was searching for the best tool to convert NSF to PDF format because I did not want to compromise the integrity of data. After a very long search, I found this Lotus Notes to PDF Exporter tool. I must say that it is one of the best tools that I have ever tried to perform file conversion. The application provides a user-friendly interface that anyone can use it without any hassle. There was n number of emails in my Lotus Notes NSF file but I want to convert only a few them to PDF. I used this NSF File to PDF Conversion tool for the same and I can easily say that it is an amazing application to perform selective emails migration to PDF file. Thanks to developer for a superb application. Hats Off! !